A new study may convince some older folks to embrace video games. Researchers at UC San Francisco say video games may offset or even reverse the negative effects of aging on seniors' brains. 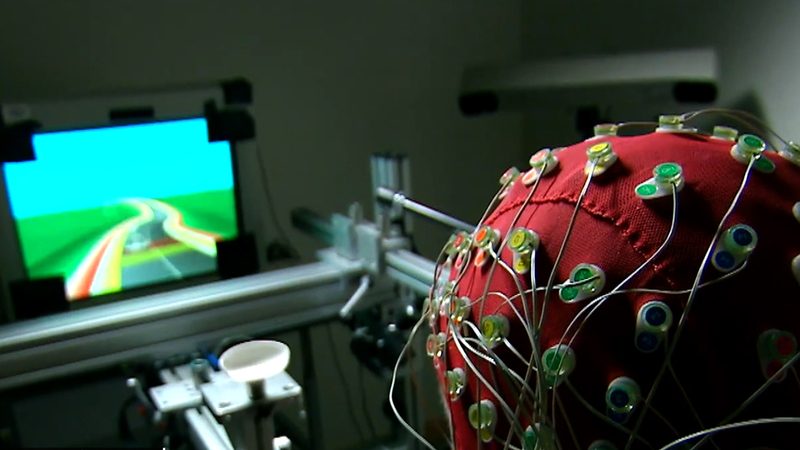 According to the study's authors, the research provides evidence that video games can alter the brain's plasticity, or its ability to change functionally over time. "The finding is a powerful example of how plastic the older brain is," said Dr. Adam Gazzaley, an associate professor of neurology, physiology and psychiatry at UCSF, said in a statement. For the study, researchers first tested a 3D game called NeuroRacer on subjects who were in their 20's through 70s, and found multi-tasking abilities declined significantly with age. In NeuroRacer, players are tasked with steering a car along a winding, hilly road with their left hand while keeping an eye out for certain signs that they need to shoot down with a finger on their right hand. Following baseline testing, researchers trained a group of 46 older adults between 60 and 85 on the game for 12 hours spread over a one-month period. If the seniors performance improved, the game would become more difficult. After four weeks, seniors had improved so much that they earned higher scores than untrained 20-year-olds. The researchers tested the older gamers six months later and their skills remained, even though they hadn't practiced during that time off. Researchers also measured the seniors' brain waves, finding boosts in a key neurological network responsible for processes that enable people to pursue their goals -- so much of a boost, that brain activity began to resemble that of younger individuals. Seniors even performed better on attention and memory tests given separately from the game. "That is the most grabbing thing here," Gazzaley, who co-founded the game's manufacturer, Akili Interactive Labs, told the New York Times. "We transferred the benefit from inside the game to different cognitive abilities." The study was published Sept. 5 in Nature. Gazzaley called for more studies to better understand how this neurological network impacts cognitive and memory skills, since it could have far-reaching implications beyond decline caused by normal aging: ADHD, depression, dementia and Alzheimer's all are associated with cognitive deficits, he pointed out. But, Gazzaley cautioned picking up a controller won't cure all aging-related brain woes. "Video games shouldn't now be seen as a guaranteed panacea," he warned Nature. This isn't the only recent paper to find video games could have cognitive benefits for senior citizens. A March study of 140 adults who were an average age of 77 found regular or occasional gamers reported better moods, higher levels of well-being and better self-reported health than non-gamers. CBS This Morning contributor Dr. David Agus, who is also a professor of medicine at the University of Southern California, said Thursday that the new study was exciting because seniors were not only able to improve their multi-tasking abilities, but were better able to remember names and showed other improvments. "You can retrain the brain," he said the study showed. Still, he agreed with Gazzaley that it's too soon to tell all seniors to play video games. He pointed out this game was designed by neurologists ---who are vying for its approval as a medical device by the Food and Drug Administration -- for one function, but going forward more needs to be done to see how it affects different brain processes. "I think part of the message of this study is video games are very powerful," said Agus.